In Red and White Plum Blossoms, Ogata Kôrin transforms a very simple landscape theme—two flowering trees on either side of a brook—into a dream vision. Executed in black ink and blotchy washes of gem-like mineral color on a pair of folding screens, the image seems both abstract and realistic at the same time. Its background, a subtle grid of gold leaf, denies any sense of place or time and imbues everything with an ethereal glow. The stream’s swelling metallic curls and spirals are a make-believe of flowing water, and its sharply tapered serpentine contour lines angle the picture plane in an unnatural upward tilt. The trunks of the trees are nothing more than pools of mottled color without so much as an outline. These forms and spaces appear flat to the eye. Yet the artist’s intimate knowledge of how a plum tree grows can be seen in their writhing forms and tangle of shoots and branches. In planning its imagery Kôrin closely considered the function of the folding screen within the traditional Japanese interior. The two sections would have been positioned separately yet near enough to each other to define an enclosed space. At 156 cm (or approximately 67 inches) in height, they towered over the average Japanese person of the day. Kôrin depicted only the lower parts of the trees, as if viewed from very near: the tree with red blossoms thrusts upward from the ground and out of sight; the white pushes leftward out of view and then, two slender branches appear to spring back diagonally downward from the top corner and jab upward. With each screen standing hinged at its central fold, a viewer experiences these exaggerated two-dimensional images in three dimensions. Stopping us in our tracks by confounding logic with this combination of pure design and intimate naturalism, Kôrin envelops us in the pulsing vitality of early spring. 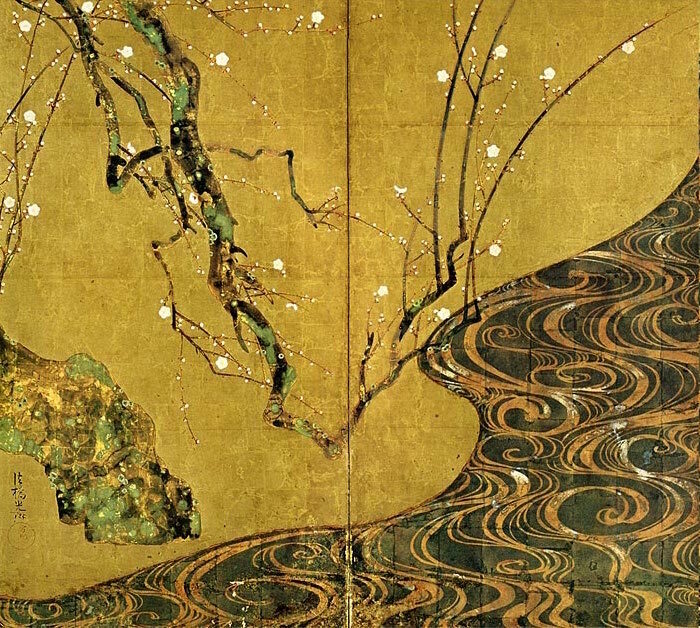 An acknowledged masterpiece painted toward the end of his life, Red and White Plum Blossoms exemplifies a style that for many epitomizes Japanese art. It has profoundly impacted modernism in the West, most famously in the work of Gustav Klimt. Since the 19th century this combination of abstraction and naturalism, monumental presence, dynamism and gorgeous sensuality has commonly been referred to as Rinpa, or “School of Kôrin.” But Kôrin neither originated this aesthetic, nor presided over a formal school; more accurately he stood at the forefront of a loose movement of like-minded artists and designers in various media. Rinpa first appeared a century earlier, in the brilliant relationship of a gifted calligrapher, connoisseur, and intellectual named Hon’ami Kôetsu, and an equally gifted painter of fans and screens, Tarawaya Sôtatsu, who created works that aimed to satisfy the luxurious tastes of 17th century Kyoto’s aristocrats and wealthy merchants (below). Entranced by a few of Sôtatsu’s paintings that he saw in the collection of a patron, Kôrin taught himself the techniques: images pared to bare essentials and then dramatically magnified, emphasis on the interplay of forms, colors, and textures, and unconventional adaptations of ink painting methods. These methods included tarashikomi, or dilute washes of color blended while very wet, and mokkotsu, or “bonelessness,” which creates forms without exterior outlines. Some scholars now use terms such as Sôtatsu-Kôrinha, Kôetsuha, and Kôetsu-Kôrinha rather than Rinpa, in recognition of its actual origins. Yet Kôrin is owed a great debt as the one who revived a dazzling creative approach from obscurity and whose vibrant works firmly established his own reputation. A profligate who squandered his family’s enormous wealth, Kôrin benefitted from the wide design experience afforded by its position as one of Kyoto’s most distinguished producers and purveyors of fine textiles. This he combined with painting studies in one of Japan’s preeminent studios. His numerous works in this sophisticated style thus encompass many media, formats and subjects—paintings in color and ink on large screens, small albums, fans, hanging and hand scrolls, printed books, lacquers, ceramics and even textiles. 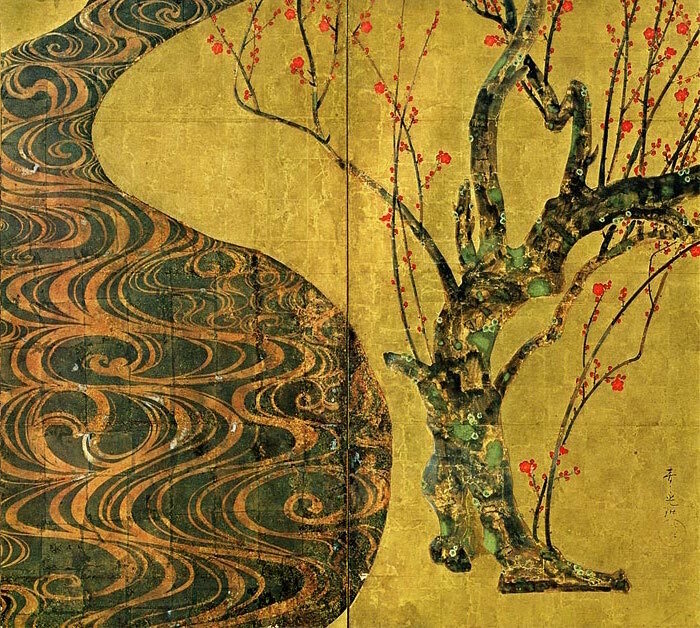 Initially inspired by Japanese classical literature, the Rinpa movement’s attention soon extended to themes from nature, including Chinese motifs that may have influenced Kôrin’s choice of plum trees for this painting. Looking now at the impact of his work from over three centuries ago, it seems incredible that a vision so dramatic, luxurious and radical could ever have fallen into obscurity. Cite this page as: Dr. Hannah Sigur, "Ogata Kōrin, Red and White Plum Blossoms," in Smarthistory, January 21, 2016, accessed April 21, 2019, https://smarthistory.org/ogata-korin-red-and-white-plum-blossoms/.